Honda is a town and municipality in the Tolima department of Colombia. Your inner history buff will appreciate Centro Historico and Catedral Nuestra Senora del Rosario. You'll explore the less-touristy side of things at Museo del Rio Magdalena and Catedral de San Miguel Arcangel. Explore the numerous day-trip ideas around Honda: Mirador De La Piedra Capira (in Guaduas) and Catedral de Nuestra Senora del Carmen (in La Dorada). Next up on the itinerary: admire the landmark architecture of Santuario Diocesano del Milagroso Senor de la Ermita, see the interesting displays at Casa Museo Alfonso Lopez Pumarejo, don't miss a visit to Puente Navarro, and contemplate the long history of Calle de las trampas. For ratings, other places to visit, reviews, and tourist information, refer to the Honda online travel route planner . Passo Fundo, Brazil to Honda is an approximately 20-hour flight. You can also drive. The time zone difference when traveling from Passo Fundo to Honda is minus 2 hours. When traveling from Passo Fundo in May, plan for a bit warmer days in Honda, with highs around 32°C, while nights are much hotter with lows around 32°C. Wrap up your sightseeing on the 20th (Mon) to allow time to travel to Ipiales. Situated on a plateau 2,950 m (9,678 ft) above sea level, the city of Ipiales enjoys a subtropical highland climate and the title of highest major city in Colombia. On the 21st (Tue), browse the different shops at Centro Comercial Gran Plaza and then admire the striking features of Las Lajas Sanctuary. To find reviews, other places to visit, photos, and tourist information, read our Ipiales itinerary maker tool . Explore your travel options from Honda to Ipiales with the Route module. Prepare for much colder weather when traveling from Honda in May: high temperatures in Ipiales hover around 19°C and lows are around 8°C. On the 21st (Tue), wrap the sightseeing up by early afternoon so you can travel to San Agustin. San Agustin remains best known for its archaeological sites, which include the World Heritage-listed San Agustin Archaeological Park. Get some cultural insight at San Agustin Archaeological Park and Alto de Las Piedras Archaeological Park. You'll explore the less-touristy side of things at El Purutal and La Pelota - Estatuas A Color. Step out of San Agustin with an excursion to Parque Arqueologico Alto de los Idolos in Isnos--about 36 minutes away. And it doesn't end there: pause for some photo ops at La Chaquira, make a trip to El Tablon, admire the verdant scenery at El Salto del Mortino, and explore the ancient world of Alto de las Chinas. For where to stay, photos, and other tourist information, you can read our San Agustin journey planning website . You can drive from Ipiales to San Agustin in 10 hours. Plan for a bit warmer nights when traveling from Ipiales in May since evenings lows in San Agustin dip to 20°C. Finish up your sightseeing early on the 24th (Fri) so you can travel to Villa de Leyva. Eschew the tourist crowds and head to Convento Nuestra Señora del Rosario de Chiquinquirá and Centro de Investigaciones Paleontologicas - CIP. Iglesia de la Renovacion and Iglesia de San Agustin will appeal to history buffs. Explore the numerous day-trip ideas around Villa de Leyva: Tunja (Capilla y Museo de Santa Clara la Real, Iglesia de San Ignacio, & more). Next up on the itinerary: pause for some serene contemplation at Iglesia de Nuestra Senora del Rosario, examine the collection at Casa Museo Antonio Narino, don't miss a visit to FIBAS Jardin de Desierto, and take in the natural beauty of Los Termales. For maps, photos, other places to visit, and other tourist information, read our Villa de Leyva trip builder . Do a combination of flight and bus from San Agustin to Villa de Leyva in 6.5 hours. Alternatively, you can do a combination of bus and flight; or drive. Wrap up your sightseeing on the 28th (Tue) early enough to drive to Barichara. A charming town of just over 7,000 people, Barichara displays rustic, dusty orange-colored architecture, protected by the Colombian People's Heritage Network. Satisfy your inner culture vulture at Iglesia Nuestra Senora de Chiquinquira El Socorro and Catedral Nuestra Senora del Socorro. You'll discover tucked-away gems like Museo del Algodon y el Lienzo de la Tierra and River Rafting & Tubing. You'll find plenty of places to visit near Barichara: Catedral de Curiti (in Curiti) and San Gil (Centro Comercial El Puente, Parroquia Catedral de Santa Cruz, & more). Next up on the itinerary: stroll the grounds of Cementerio Barichara, take in the architecture and atmosphere at Catedral de la Inmaculada Concepcion, admire all the interesting features of Cafe Alfania, and contemplate in the serene atmosphere at Iglesia de Santa Lucia de Guane. To see where to stay, photos, traveler tips, and other tourist information, go to the Barichara trip planner . Drive from Villa de Leyva to Barichara in 3 hours. Alternatively, you can take a bus. In May in Barichara, expect temperatures between 30°C during the day and 22°C at night. Wrap up your sightseeing on the 1st (Sat) to allow time to travel to Medellin. You'll discover tucked-away gems like Museo de Antioquia and Laguna de Guatape. Get some historical perspective at Catedral Nuestra Senora del Rosario de Chiquinquira and Basilica de Nuestra Senora de la Misericordia. Explore the numerous day-trip ideas around Medellin: Catedral Nuestra Señora de las Mercedes (in Caldas), Basilica Menor Del Senor De Los Milagros (in San Pedro de los Milagros) and Parque Tematico Replica del Viejo Penol (in Penol). There's lots more to do: see the interesting displays at El Castillo Museo y Jardines, pause for some serene contemplation at Iglesia de Nuestra Senora de los Dolores, take in the local highlights with Walking tours, and contemplate in the serene atmosphere at Nuestra Senora de la Asuncion. To find reviews, traveler tips, and tourist information, you can read our Medellin trip itinerary tool . Getting from Barichara to Medellin by combination of taxi and flight takes about 3.5 hours. Other options: drive; or do a combination of taxi and bus. In June, daytime highs in Medellin are 33°C, while nighttime lows are 20°C. Finish your sightseeing early on the 7th (Fri) to allow enough time to travel to Cartagena. Discover out-of-the-way places like Plaza de San Diego and St. Catherine of Alexandria Cathedral. Satisfy your inner culture vulture at Castillo San Felipe de Barajas and Iglesia de la Trinidad. Next up on the itinerary: steep yourself in history at Walled City of Cartagena, don't miss a visit to Plaza de La Trinidad, pause for some serene contemplation at Iglesia de Santo Toribio, and contemplate in the serene atmosphere at Templo de Santo Domingo. To see reviews, more things to do, maps, and more tourist information, read our Cartagena driving holiday app . You can fly from Medellin to Cartagena in 4 hours. Alternatively, you can do a combination of flight and bus; or drive. Plan for somewhat warmer temperatures traveling from Medellin in June, with highs in Cartagena at 38°C and lows at 30°C. Wrap up your sightseeing on the 14th (Fri) to allow time to travel to Mompos. Perched on an island at the confluence of the Magdalena and Cauca rivers, Mompos offers a charming blend of historical architecture and traditional Colombian culture. Eschew the tourist crowds and head to Iglesia de la Inmaculada Concepcion and Santa Barbara Church. Popular historic sites such as Church of Santo Domingo and Church of San Francisco are in your itinerary. There's much more to do: pause for some serene contemplation at Iglesia de San Agustin, take in panoramic vistas at Iglesia de San Juan de Dios, make a trip to Escuela Taller Santa Cruz de Mompox, and explore the different monuments and memorials at Cementerio de Mompox. For where to stay, reviews, ratings, and more tourist information, read our Mompos tour app . Getting from Cartagena to Mompos by car takes about 6 hours. Wrap up your sightseeing on the 17th (Mon) early enough to travel to Santa Marta. 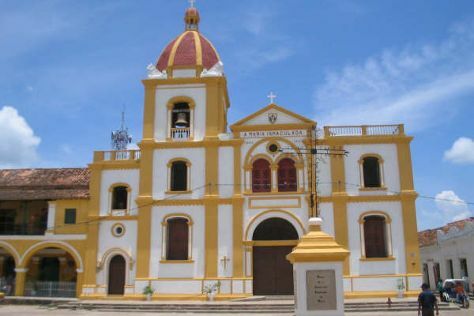 Visit Iglesia San Jose and Iglesia San Jeronimo for their historical value. Get some cultural insight at Quinta de San Pedro Alejandrino and Taironaka Turismo Ecologico. You'll find plenty of places to visit near Santa Marta: Aracataca (Casa del Telegrafista & Gabriel Garcia Marquez Museum) and Minca (Memorial Center of the Sierra Nevada & Museo del Cacao de Minca). The adventure continues: enjoy the sand and surf at Cristal Beach, meet the residents at Mundo Marino, stroll around Parque de Los Novios, and see the interesting displays at Museo del Oro Tairona - Casa de la Aduana. To see other places to visit, photos, more things to do, and tourist information, use the Santa Marta online vacation planner . Getting from Mompos to Santa Marta by car takes about 5 hours. In June, daily temperatures in Santa Marta can reach 39°C, while at night they dip to 30°C. Wrap up your sightseeing on the 22nd (Sat) to allow time to travel to San Andres Island. Step off the beaten path and head to West View and Playa de Spratt Bight. Museum-lovers will appreciate Island House Museum and Parque Tematico El Pueblito Isleno San Andres. Next up on the itinerary: step off the mainland to explore Johnny Cay, pause for some serene contemplation at Primera Iglesia Bautista, enjoy the sand and surf at Playa de San Luis, and look for all kinds of wild species at La Piscinita. 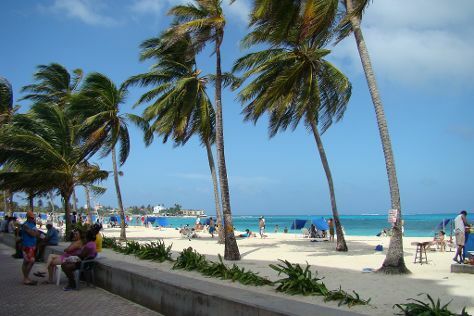 For reviews, other places to visit, and tourist information, refer to the San Andres Island trip itinerary maker site . You can do a combination of shuttle and flight from Santa Marta to San Andres Island in 3 hours. Alternatively, you can do a combination of bus and flight. While traveling from Santa Marta, expect little chillier days and about the same nights in San Andres Island, ranging from highs of 36°C to lows of 30°C. Finish your sightseeing early on the 28th (Fri) so you can ride a ferry to Providencia Island. Although part of Colombia, the small, isolated Providencia Island retains its Caribbean culture and English-Creole language. Step off the beaten path and head to Crab Cay and Lighthouse Providencia. Spend the 1st (Mon) exploring nature at McBean Lagoon National Natural Park. And it doesn't end there: see some colorful creatures with a scuba or snorkeling tour, head off the coast to Santa Catalina, take in the dramatic natural features at Morgan's Head, and don't miss a visit to The Peak Forestry Reserve. To find where to stay, reviews, and more tourist information, read our Providencia Island tour itinerary builder . You can ride a ferry from San Andres Island to Providencia Island in 3 hours. In June, daily temperatures in Providencia Island can reach 35°C, while at night they dip to 30°C. Finish up your sightseeing early on the 2nd (Tue) so you can travel to Bogota. Museum-lovers will appreciate Gold Museum (Museo del Oro) and Barrio La Candelaria. Visit Catedral de Sal and Bolivar plaza for their historical value. You'll find plenty of places to visit near Bogota: Zipaquira (Catedral Diocesana & Plaza de los Comuneros). Next up on the itinerary: admire the masterpieces at Museo Botero del Banco de la Republica, don't miss a visit to Teatro Mayor Julio Mario Santodomingo, get engrossed in the history at Casa Museo Quinta de Bolivar, and take in the architecture and atmosphere at Iglesia de San Francisco. To see maps, reviews, more things to do, and other tourist information, use the Bogota online trip maker . Getting from Providencia Island to Bogota by combination of ferry and flight takes about 6.5 hours. Traveling from Providencia Island in July, expect Bogota to be cooler, temps between 21°C and 10°C. Wrap up your sightseeing on the 8th (Mon) early enough to travel back home.